Editor’s note: PSP reader Jeff Manzella recently got in touch to share the news that his young son Ethan, who plays for Continental FC, had been selected to represent the US in the fourth annual FCBEscola International Tournament in Spain. We asked Jeff if he could write a report of the tournament upon the family’s return from Barcelona, and we’re happy to share that with you below. The last of the day’s sun was starting to set in a fiery red beyond the stadium walls. The supporters banged on their drums so forcefully that I could feel it in my body. Flags were flying in red and yellow and blue. The colors of Catalunya. The colors of FC Barcelona. We were watching the Barcelona B team play against Tenerife in an energy-filled match at their “Mini-Estadi” next to the magnificent Camp Nou. These young men of Barcelona B could one day play on the A team –- the next Messi or Neymar or Pique. They played with heart and an obvious love of the beautiful game. Moreover, they inspired 12 young American soccer players who were there that night and about to play in the biggest tournament of their lives. My family came to Barcelona to attend the fourth annual FCBEscola International Tournament held during the week before Easter. 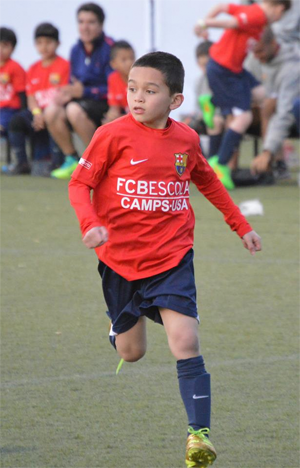 About two months ago, my son, Ethan Manzella, was selected by FC Barcelona to play on their U-8 Team USA (consisting of the 2007 and 2008 birth years). What placed him on the team was strong play during the FCBEscola youth soccer camps that FC Barcelona runs throughout the United States and the world. Over 3,400 kids in the US participated, and Ethan was selected as 1 of only 12 U-8 kids to represent Team USA. Both the camp and the tournament itself taught the Barca Way of playing -– tiki taka -– keeping the ball on the ground, passing and sharing the ball, switching fields, and ultimately scoring beautiful goals. Although there was plenty of individual skill and fancy footwork, the focus was on a team game. Teams that played this way most often — defending as one and playing together — were the teams that were most successful. Ethan’s Team USA played against some of the very best 7 and 8 year-old soccer players from around the globe. Spain, Poland, Italy, Turkey, Japan, China, India, Brazil, Peru, and the US were all there and more. Not only did the American boys play with these teams, but they competed very well, beating teams from Spain and Brazil and finishing 6th overall in the age group. Ethan Manzella in action with Team USA in Barcelona. Photo: Jeff Manzella. In Game 1, USA drew with Escola Barcelona Carmesi 2-2. Ethan started at right back, played the entire game, and scored a goal. Game 2 was a big win over Brazil 3-2 and again Ethan got the start at right back and hit the post on a shot. Game 3 was our best, a dominant win over Technification Catalunya Grana 8-1. Ethan again started at right back, also played center midfield, and was fouled 3 times in or near the box, leading to 3 free kick goals by teammates. Th0se early results allowed us to win our group and advance to the Championship round. Game 4 was our big letdown game, a 4-0 loss to Poland (who ended up in the finals). Game 5 was a bounce back game, a 3-1 win over Barcelona Blau. Our final game was a rematch with Brazil for 5th or 6th place overall. The game ended in a 3-3 draw, but USA lost on penalty kicks 8-7, and had to settle for the 6th overall placement. Ethan again started at right back in that game, scored a goal, and scored on his PK. Since Ethan started at right back in five of the six games and got the bulk of the playing time in that position, you may think he plays right back on his club team, Continental FC. The truth is that all of the kids on Team USA — meeting for the first time in Barcelona two days before the tournament — considered themselves forwards or attacking midfielders. This is not surprising as each was a top scorer at home in their age group, and many of the boys played one or even two years up in age at home. 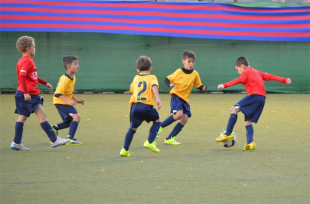 The biggest challenge for the Barca coaches was identifying a few boys who had the speed, strength, poise, and skill to play defense against elite academy programs from around the world, teams where the kids had played together for years. Ethan and several others got a crash course on defensive positioning, and he adjusted like he had played right back for years. In fact, our team’s success at defense against elite scorers was the highlight of the tournament for me -– and all of it was done with only two days of practice before the start of tournament play. In the end, the tournament lasted four days, with four age groups (U-8, U-10, U-12, and U-14), 15 countries (92 teams total), and more than a thousand youth soccer players. 276 matches were played in the tournament and 1,234 goals scored –- about 4.5 goals per game. The tournament also convinced me that, with the proper training and commitment, our USA kids can compete with anyone. Finally, some words must be said about Barcelona itself and Kaptiva Sports, the company in charge of the USA summer camps. Beyond the tournament, Kaptiva arranged for us to tour the Camp Nou and FC Barcelona Museum, and exposed us to the many beautiful sites of Barcelona. They made sure it would be the trip of a lifetime for both the player and his family. We visited Sagrada Familia Basilica (or Church of the Holy Family) –- a church in Barcelona designed by famed architect Antoni Gaudi –- construction of which began in 1882 and continues today. We saw the 1992 Olympic village and stadium, the Cathedral in the Gothic Quarter, and the monument of Christopher Columbus where he was greeted upon his return from the New World. I don’t know if Ethan will ever be lucky enough to be selected for this honor again, but if he does, my family will rush to the airport to return to beloved Barcelona. Waive the flags and bang the drums. Visca Barca! Really, there are no words. Magic. Awesome, I am at a point that I will be having kids within 1-2 years, and it’s things like this that make me so excited, make me want to keep up with reffing, get my coaching certificate, and continue playing as long as my legs hold up. Great story, wonderful experience, and a positive outlook that maybe the right things can and are being done here, and that the U.S. has a chance going forward. Glad you had a great trip. Fantastic stuff – congratulations Ethan! stick with “the Barca Way” kid! Well done! Okay so I came up with some words cause now I am curious. How old is your son? Were you able to talk to other families? Did you find the age of the kids was on older part of spectrum? Did they chose ages based on calendar year or based on the US soccer version of July 31st cutoffs. Tell me about the technical qualities of the kids chosen- extraordinary? How bout the size of the children they chose compared to the other kids they played against. You certainly do not have to answer all these questions- but your article does lead one in this direction. You know, I watch BeIn Sports habitually and often tune in to Barca TV and love love love when they highlight their youth academy showing you snippets of games against other professional academies. We are SO TOTALLY FAR FAR FAR away. These children at 8 9 10 play the game exquisitely. Very little flash. Very little extravagance- just functional futbol- to a child – each and every one of them beats the first defender every time. I talk so much to my young children about nuance of the game, the little things, and we watch habitually the great players and teams in the world wether weekly or on YouTube and almost always — I stress to them the importance of beating the first defender. It is a little known and seldom seen quality of players at the highest levels of the game in this country let alone the children who play it. If you can beat the first defender every time and the other team knows it — every thing changes in the way a team will approach you. This is a special article Jeff. It is clear you have a little boy playing the game at a high level and it would be magnificent as he matriculates along if you checked in with similar articles- or talked more deeply, maybe about the inner battle you may or may not be contemplating (now that you have seen you young child already on the international stage) about the arc of his development in the states or abroad. It is a massive consideration — especially when levied against the ignorance of US soccer’s ability to consistently recognize the truly talented. U8 Team was 2007/08 birth years, they use the academy age system by birth year only (not July 31). Ethan is 2007 so yes he was a strong player on the team and got lots of playing time and responsibility on defense, but some of the 2008 kids also very good. Technical quality and passing was amazing, Barca focuses on ball skills, balance, speed, etc. Size did not seem to be a big factor, talent was. And our teams were playing the BarcaTV kids in the various age groups – Barca’s top academy teams were in the tournament and even won the U8 group. The talent you see on BeIn, these are the same kids and talent and our top US boys at the tourney showed with similar talent. But there are also local kids that Ethan plays with here in PA that could hang in the tournament as well. Long term commitment and practice is key. Thanks to all the posters for your support and I will keep you posted on Ethan’s progress.